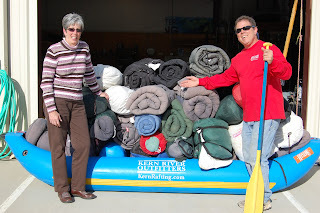 Continuing our long-standing relationship with the South Fork Middle School, here in the Kern River Valley, we were able to donate our retiring generation of sleeping bags to their outdoor program. Over fifteen years ago we started our partnership with South Fork School, when their teachers came up with the novel idea of having their 7th and 8th graders spend a week camping, hiking, climbing, boating and learning about this incredible area. When the program started we supplied the kitchen gear, and whatever other odds and ends that they needed. Since then the program has grown. Through donations, local goodwill, and the efforts of their dedicated teachers and administrators they have been able to collect much of the equipment that they need to run this terrific program. We will get to see the kids in a few more weeks when we will again run the whitewater portion of their program on the Upper Kern. Jana Maki, Resource Specialist at South Fork Middle School, receives the sleeping bags from Gary “Firestarter” Thornbrugh a former teacher, current guide, and our resident “good guy”.